Kids love to get wet and dirty and now their feet can stay dry if they decide to run through the rain. These yellow Spongebob rain boots will be a hit with all the kids. 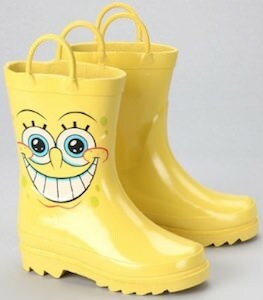 The rain boots are yellow and have a big picture of Spongebob’s face on the side. Made from rubber these rain boots are strong and made for rain. And don’t worry about mud and stuff it’s no work at all to clean these Spongebob Squarepants rain boots. And the easy slip on style of these rain boots will make sure that you kid will not leave the house with some footwear to wear special because they love Spongebob. You can get these yellow rain boots in a range of toddler and little kids sizes so that they fit perfectly around their little feet. Time to get ready for rain, snow and mud. Get them these Spongebob Squarepants Rain Boots.